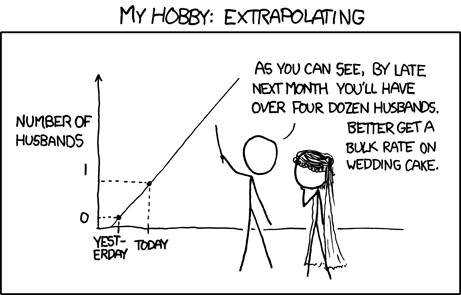 Extrapolation in mathematical terms means “the extension of a graph, curve, or range of values by inferring unknown values from trends in the known data”. There’s a rather poor scientific joke which involves ‘extrapolating the line’ from a single data point. 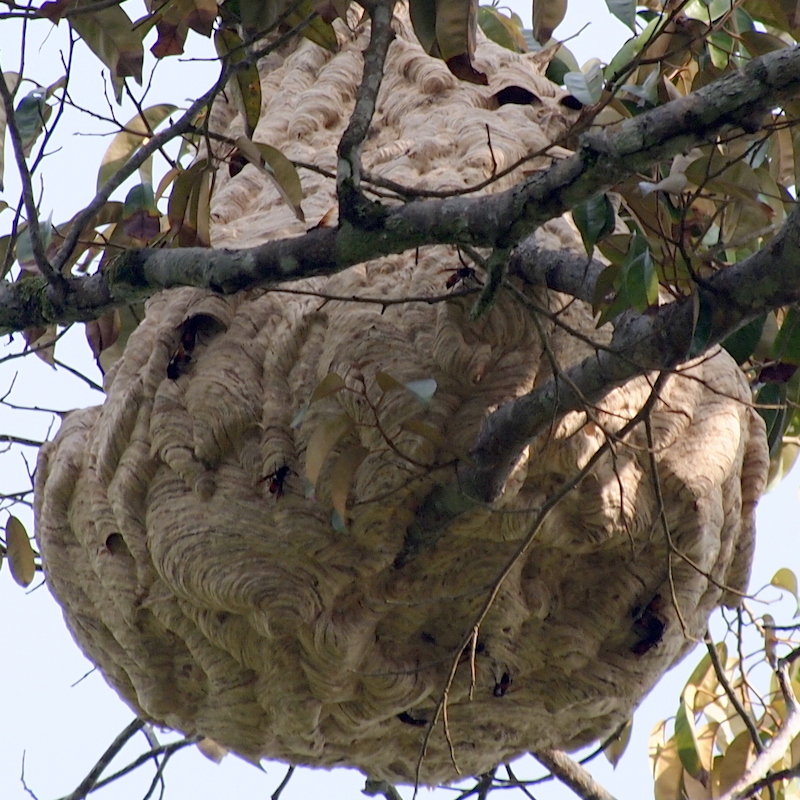 As many will be aware, at those who members of a beekeeping association or internet-savvy, an Asian hornet nest was discovered in Tetbury, near Bristol, in September 2016. 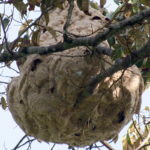 Although the nest was destroyed (and other nests were not found) there remains the concern that the Asian hornet may be established here. If that’s the case, or if when it arrives again, how far and how fast will it spread in the UK? A recent publication by Matt Keeling and colleagues has attempted to to address this. You’ll appreciate the relevance of the cartoon above … August 2016, no hornet nests, September 2016, one hornet nest. How many can we expect in the future? Unsurprisingly (the clue is in the name) the Asian hornet comes from Asia. The native distribution includes tropical South East Asia where it exists in a number of different colour morphs or sub-species. However, it spreads – naturally on its own and with the inadvertent help of man – and is now established in Korea, Japan and North West Europe. 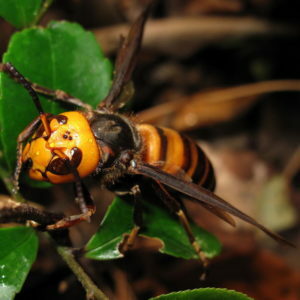 The Asian Hornet appeared in South West France in 2004. It was thought that overwintering queens were imported with a shipment of pottery from China (it is the V. velutina nigrithorax subspecies – see map for native distribution). Since 2004 the Asian hornet has spread widely across France, Spain, Belgium, Portugal and Italy. You can view a dynamic Google map showing location and time of detection here. 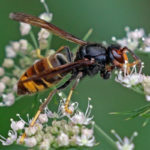 It’s a short hop across the Channel from Northern France for an insect that flies strongly and disperses widely, so there was every expectation that the Asian hornet would appear in the UK in due course. Remember that bluetongue virus of sheep was introduced to the UK in 2006 by tiny Culicoides midges wafted across the Channel on the prevailing South Easterly winds. Brexit or not, the Asian hornet can easily get to Southern England. Asian hornets were first found in Tetbury, Gloucestershire, in September 2016 and subsequently in North Somerset. A nest was found in Tetbury and destroyed. Haplotype analysis demonstrated that, unsurprisingly, the hornets were related to those in Northern France. Worryingly, this analysis also demonstrated that the hornets were related, but no closer than at the grandparent level. This suggests one of two scenarios. Either there were two separate incursions from France by hornets that were closely related or the Asian hornet was established in the UK before 2016 and the Somerset and Gloucestershire finds represent progeny (two generations later) of this initial invasion. There have been no further reported Asian hornet finds on the mainland (as of early August 2017 and remembering that absence of evidence doesn’t mean evidence of absence) though additional nests have been found on Jersey and it’s possible that the hornet is established in the Channel Islands. Whether or not the Tetbury hornet incursion has been contained there remains the question about how far and fast will the Asian hornet spread in the UK. This is the sort of thing that can be modelled by epidemiologists. Taking account of a variety of factors such as the numbers of queens produced per nest, the environmental suitability for the hornet, the dispersal distances and – importantly for a species originating in tropical regions – the latitude (and hence temperature). Much of the real numbers for these various factors come from studies of the spread of the Asian hornet in France. For example, the mean dispersal distance of new queens is about 18 miles i.e. Tetbury to central London in about 5 generations. In the figure above A-D are the early years (<5), E and F are the predictions for 10 and 20 years hence. Remember, this is an inexact science as the predictions are being made from a very small founder population. G shows the confidence limits which, at 90% (the palest shading) are very broad. As a beekeeper in Scotland the potential to spread North is a concern … those of you living further South can simply jump ahead to the conclusions. 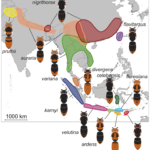 A key feature of the prediction Keeling and colleagues made was that increasing latitudes (and possibly altitude going by the pale shading of North Wales and the Pennines, though this could also be lack of suitable nesting environments – the Asian hornet prefers oak trees apparently) will restrict breeding success and hence spread due to reduced temperatures. They modelled this by assuming reproductive success/spread (actually queens/nest) was 100% in Andernos-les-Bains, France (where much of the data used for the modelling was derived) and 0% in the North of England. This mirrors the situation for the European hornet which is much less common in Northern England. Assuming a linear decrease in queens per nest over this distance they reproductive success in Tetbury is only 38% that in Andernos-les-Bains. With these assumptions, Scotland is safe. I should add that I’m talking about natural distribution and spread. A single Asian hornet was discovered at a “retail warehouse in the central belt of Scotland” in March 2017. Although there’s no further official news about this discovery it seems likely it was imported ‘on the back of a lorry’ (and the SASA/NBU people will be able to tell where from after genetic analysis) to one of the giant distribution warehouses in Motherwell or Livingston. 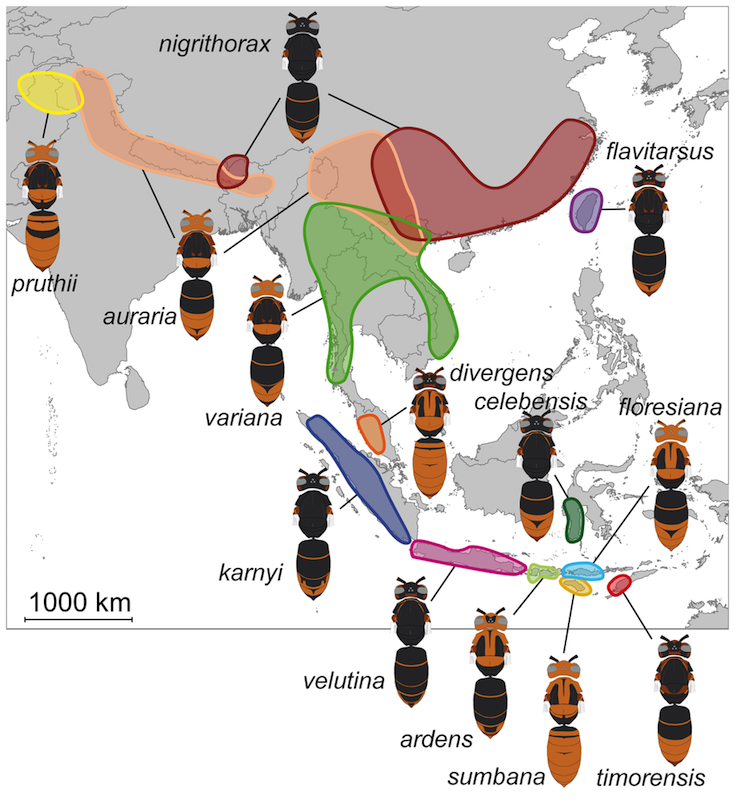 If the assumptions made about reproductive success at increasing latitudes are correct, this type of introduction is unlikely to result in the Asian hornet getting established in Scotland. With only one (or two?) incursions and no further reports in 2017 it’s possible that the Asian hornet is yet to become established in mainland UK. Once here – and I think it’s pretty certain it will get here and become established – the speed with which it spreads may look like the model proposed here. If the underlying assumptions on reproductive success, dispersal distance etc. are representative of the situation in the UK then – without effective intervention – we can expect it to be widespread within a couple of decades. However, a feature of all epidemiological modelling is that they are subject to revision and reinterpretation … inevitably leading to further publications. † Don’t mistake the Asian or Yellow-legged hornet (Vespa velutina) with the Asian giant hornet (Vespa bloodyenormousandterrifying). The latter has a wingspan of 7.5cm and its proper scientific name is Vespa mandarinia. A number of newspaper articles in autumn 2016 made this mistake. 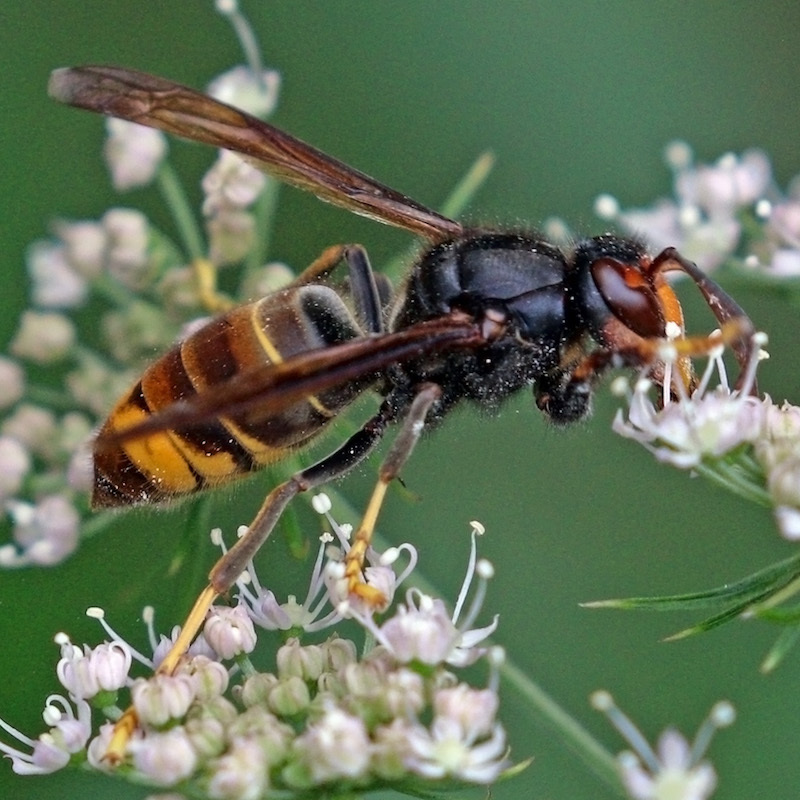 Many also chose to use images of the European hornet (Vespa crabro) or other large stingy-looking insects … none of which are likely to help the public correctly identify the invasive Asian hornet. This entry was posted in Beekeeping, Invasives and tagged asian hornet, Budge, extrapolation, invasive species, Keeling, Scotland, Tetbury, Vespa velutina, xkcd.com on August 18, 2017 by David. I’m within hornet flight of Tetbury and have been putting out sentinel traps. 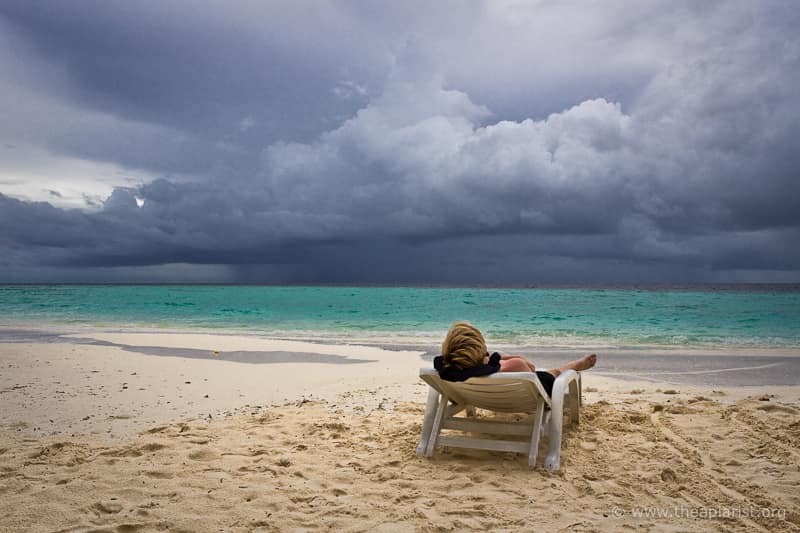 Obviously there has been nothing to report so far but I am pessimistic for the longer term. The dispersing queens can move a lot further and faster than many appreciate. The figures used in the paper were the average of a distribution. With multiple generations the advancing wave front of invasion can be as much as 80 km/year (~50 miles). Apparently haylage can be thought of as highly nutritional hay and without dust and spores. I think you’re the first person in three years to comment on the ‘pic of the week’ (which don’t change every week due to my laziness 😉 ). I’ve seen that blog a few times but hadn’t seen that post. Sobering. What it also shows is how tricky the nests will be to locate in trees which are in full leaf. The Keeling paper discusses the impact of control measures and I’ll write about these – together with some more radical solutions – sometime later in the year. Perhaps the photonic fence could be modified to select and zap asian hornets. Though I expect a lot more energy would be required to zap a hornet instead of a mosquito the resulting mid-air explosions could be quite satisfying to watch.